Creative agencies, freelancers, and artists have certain needs that not all themes can offer. First off, they have to show their creativity. This is, after all, the reason why customers avail of their services. They are from a creative industry, and everything they do must reflect that skill. As such, their websites should be a healthy balance of functionality and creativity, and it may be difficult to find the right theme for that. The good news is the WordPress can offer many themes that can fully support the needs of creatives agencies, freelancers, artists, or even just regular bloggers who want to have an artistic outlet online. WordPress, a reputable website building content management system, has several creative themes that are not only designed beautifully but are also highly functional. This is important because creative agencies and companies need to have full support for the business side of things. With the complete package of these themes, the website will ensure an outstanding user experience for visitors of the site. Out of all the creative themes out there, here are the best creative WordPress themes of 2017. 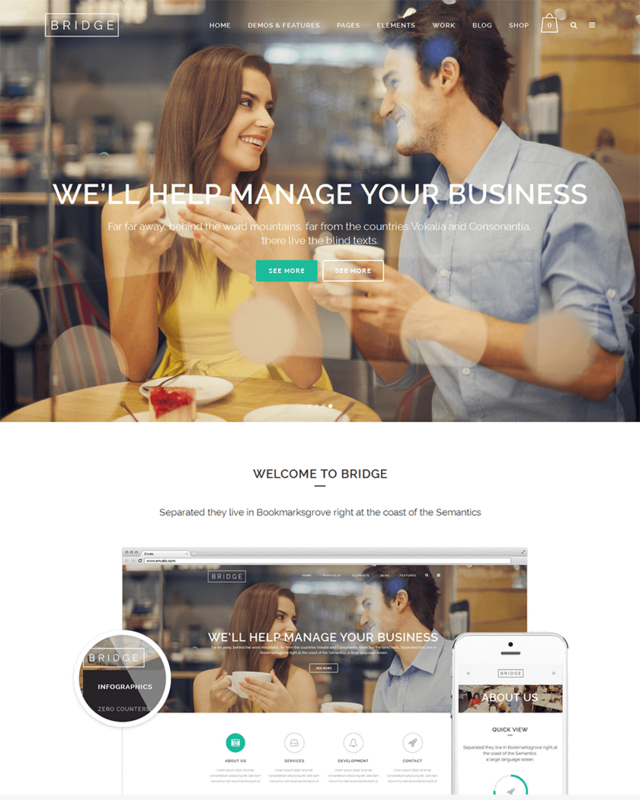 Bridge is a modern and professional creative WordPress theme fit not just for professional creatives such as agencies. It is a very flexible theme in the sense that you can literally make it however you want it to. The default demo really says it all. Upon opening a website using Bridge, you will see a full width background. This is very interesting because it can be an image or a video. This is very impressive because it is visually appealing, and it gives the owner a lot of creative freedom. In addition, Bridge has over 200 demos, showing that this really is the type of theme for creative people and professionals. Using this theme is a chance to showcase their own creativity, making their own unique website to lure and attract people. Creative companies and freelance artists can also use their website to sell their products and services directly from the site. Bridge is WooCommerce compatible, so all you have to do is present your products and services and have your visitors access them. Uncode is simply stunning, just how it presents itself to be. It allows creatives, whether freelancers or creative agencies, to showcase their concepts and art in a visually stunning manner. The good thing about Uncode is that it is multipurpose. Creative agencies and freelancers are not the only ones who can use Uncode. Classic companies and businesses can use this, too. It opens up with a full width image, which is also a slider. The slider has smooth animations that makes it extra creative. In its sleekness, Uncode can make a company look extra professional. With Uncode, artists can showcase their products and artworks in a grid of photos just below the slider. For companies, there is also a portion where you can highlight your services in compact texts. Uncode developers have developed over 30 concepts just to give an idea of how flexible the theme is. Uncode’s interface doesn’t really differ so much from other modern themes, but it does help show artistic hues of creatives. 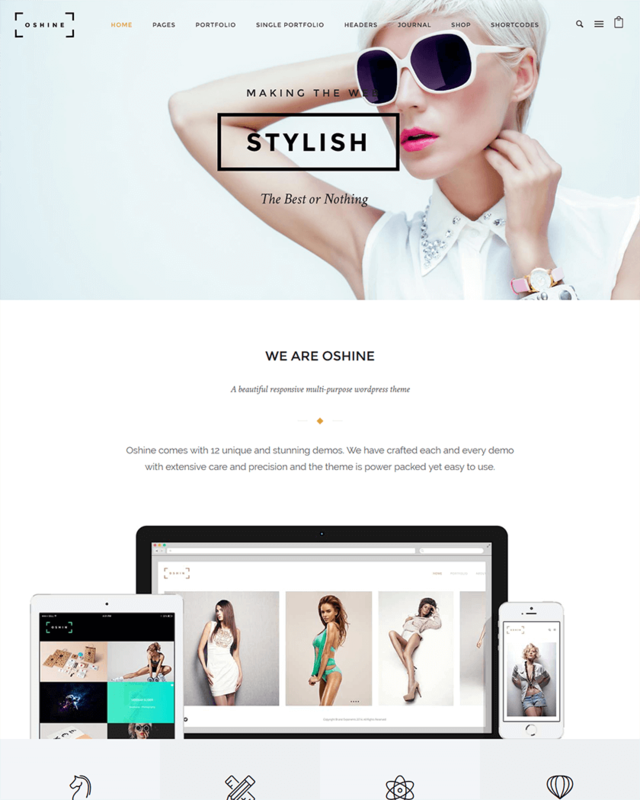 Oshine is also one of those creative WordPress themes that exudes professionalism and modernity in its design. Its flexibility covers uses of photographers, other artists, creative agencies, and fashionistas. To prove that Oshine is flexible enough to accommodate artists and their wants and needs, developers created 27 demos on how Oshine can be applied. The main demo, however, is already beautiful in itself. It opens up with a full width background image that is integrated in the header. Scrolling down, you will notice that texts are well-placed and compact for visitors to have breathing spaces for their eyes. Its links are fascinating as well. They are animated -- once your mouse hovers on them, a subtle movement happens to these icons. They aren’t overbearing, and they are simple enough to be fully integrated to the entire modern theme of Oshine. Oshine definitely has a unique layout and design, especially as this is highly customizable. This is perfect for artists who want to have everything in one website. 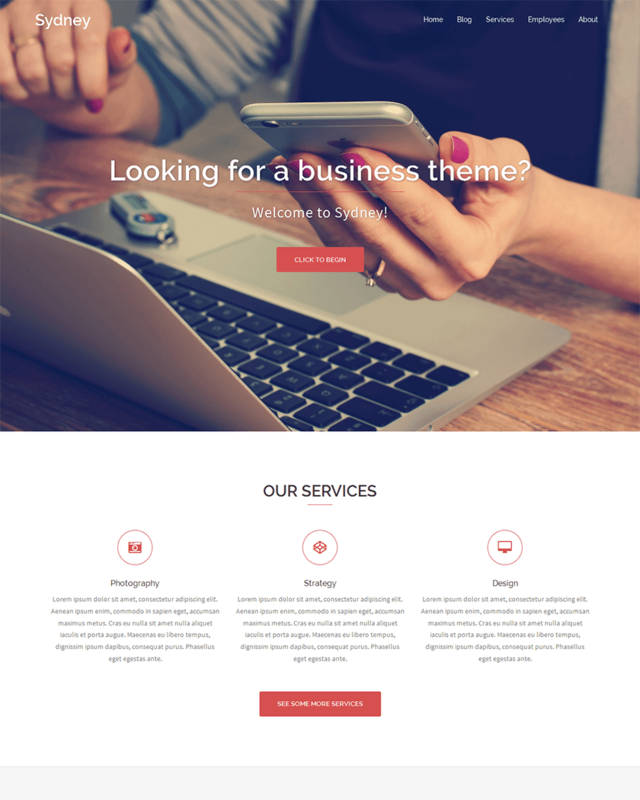 Sydney is a powerful theme suitable for business websites and creative professional portfolios. With features such as parallax backgrounds and a full screen header, you’ll have plenty of opportunity to showcase your work. You can easily tailor your home page with Sydney’s front page block layout system, and customize your site with custom colors, Google Fonts, and more. 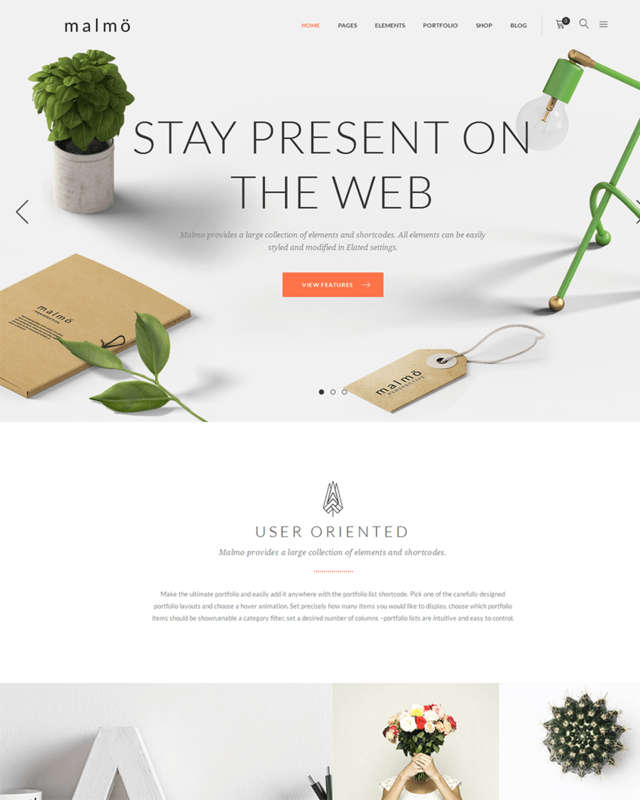 This theme is a fantastic choice for any type of creative business. It provides a beautiful home page portfolio, and its customization options give you everything you need to showcase your work and attract new clients. Furthermore, features such as a sticky navigation menu make site exploration a breeze. 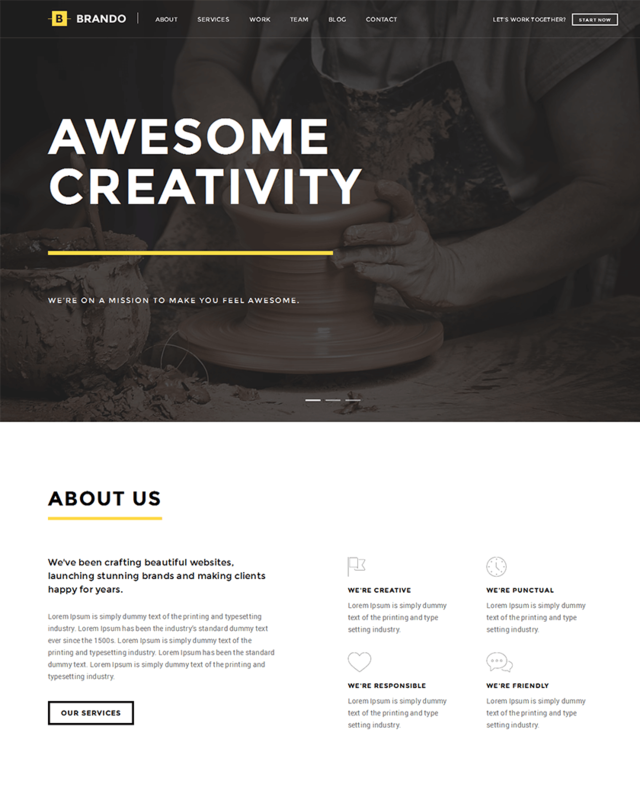 Beoreo follows the same common feature of creative WordPress themes by opening up with a full width image, which is actually a slider, that has animations as well. This follows as this makes for a good impression, at least visually, for visitors. 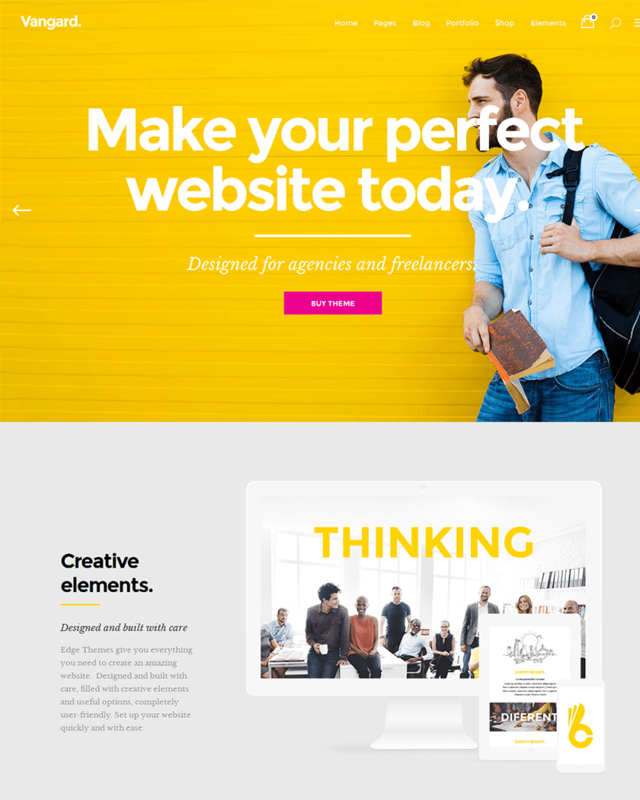 Beoreo has only 18 homepages demo, so to some extent, it does not seem so flexible as the other previous creative WordPress themes. It seems that Beoreo is leaning towards practicality -- it ensures that, as a theme, it has all the features that a creative person or company would like to have. However, it still gives the owner of the website creative freedom, although very limited. The demos of Beoreo, however, are very impressive. Each layout seems to be a different theme. As such, it seems that Beoreo, although with its limited demos and creative freedom, ensured that each website using the theme will still look unique and different. Milano is definitely a unique creative theme, perfect for those who want to shift from that usual and standard look of most creative themes out there. How is Milano different? The look says it all. Upon opening a website using the Milano default homepage, you can see that the font is eccentric. It doesn’t follow the standard straight-edge font styles most themes use now. Although different, Milano still looks modern in its own way. Milano is two-toned. The background color is mainly white, and the foreground is gray, as what is seen in the default live demo. However, Milano still ensures that this can be customized. Not all websites can have the same color. Developers prepared a lot of sample demos for Milano. It presents a first batch that shows how Milano can be used. It can be used by a photographer, an agency, a freelancer, an architecture, or an online entrepreneur. A second batch of demos shows how Milano can be monochromed. The other sets of batches show how Milano’s layouts can be customized. 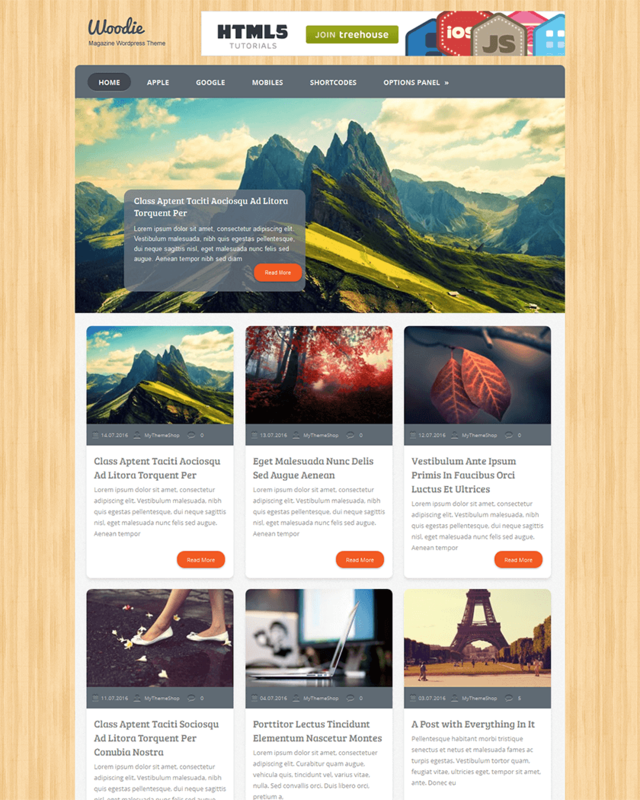 Calafate is definitely a creative theme for WordPress users, as evident in its design. Actually, the layout of Calafate seems very simple and modern. It opens up with a simple header at the top that contains the website title at the very left and navigational links at the right area. A small menu icon is seen alongside the navigational links. Right below it is the website content, but these are displayed as photos. There are several interesting and fascinating elements about Calafate that not a lot of websites have. For instance, hovering your cursor on any of the images will show you which category it belongs. In addition, the social media links of Calafate are seen at the right margin of the entire page. At the left margin, there is a search bar icon and an option to scroll back at the very top. At the very bottom, the footer allows the website owner to put a short description or call to action for visitors. 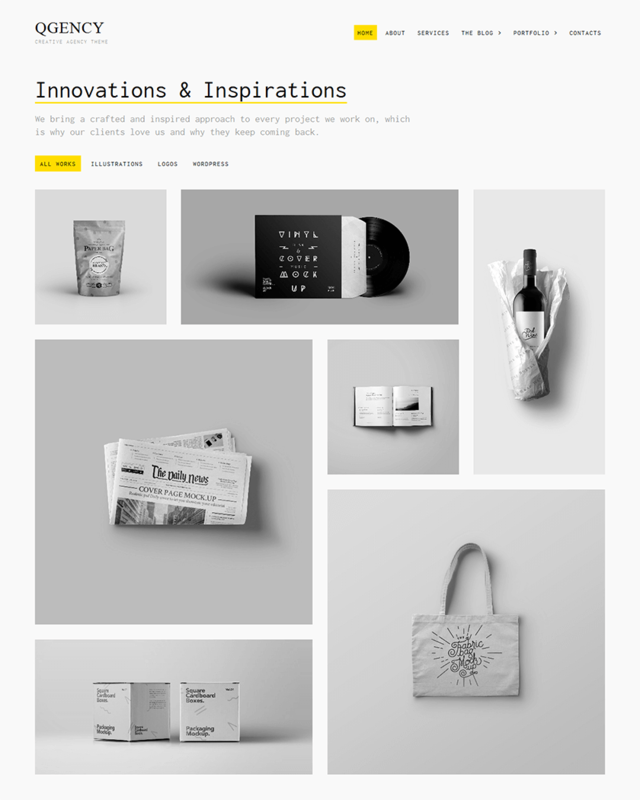 Vanguard is also a modern and quirky theme that fits young creatives. Although it still looks professional, Vanguard is for a certain target market. Aside from the youth, it is good for those who want to veer away from stiff and uptight professionalism into a more casual and fun vibe. Upon opening Vanguard, you will see that the entire page is filled with a single color and the website title right smack in the middle with big bold letters. What a way to be remembered! What’s interesting is that Vanguard isn’t scared to put various colors in its design. You will notice that are different symbols and accents in different colors just as you open the website. This can be changed, of course. Vanguard has prepared several layouts for different uses, making it flexible and highly customizable. Apart from the evidently quirky design, Vanguard has various standard features that are necessary for freelancers and agencies, which are who developers of Vanguard are eyeing when they created this theme. Hook definitely has the vibe that will get you hooked -- a very creative WordPress theme for those who want their website to be experiential. Its default demo layout is already impressive in itself. It opens up with a slider that is different than most sliders. It is full width, and it has a background image. But it is divided into three sections. These sections are links to blog posts, and when you click on the arrows of the slider, it gives you more options. What’s interesting about this slider is that when you hover on these sections, it changes the background image of the entire slider to the image of the specific blog post. Another fascinating thing about it is that the images are not limited to just images. They can be videos with sound. It’s really a sensory treat for visitors of the website. Scrolling down, you can see a layout that’s well-placed. However, for those who have slow internet and browsers, the features of Hook can be dauntingly slow. Malmö is a clean WordPress theme that almost fits the definition of minimalism. It has a crisp look about it, making sure that whatever you highlight will be highlighted. In its default form, Malmö follows the same standard look as some of the creative WordPress themes out there. 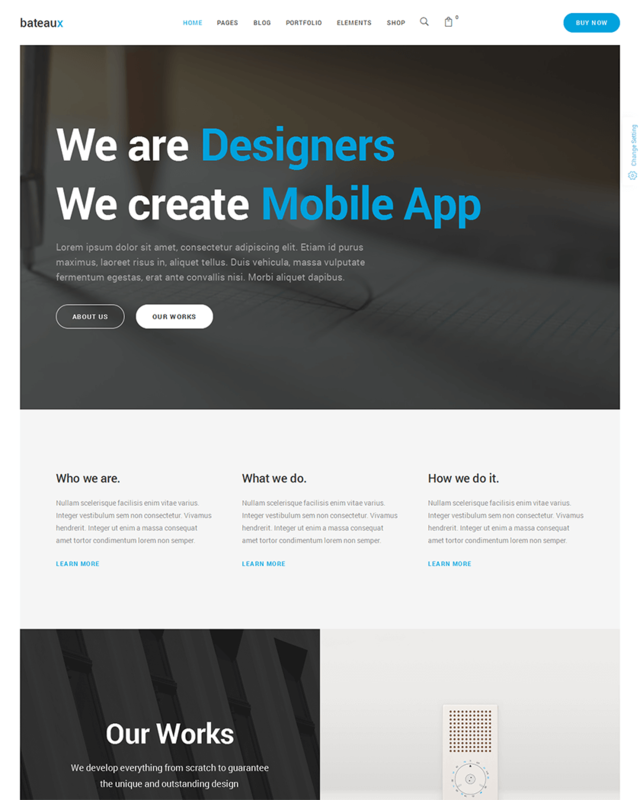 It has a full width slider with a header that is integrated in the background image. The slider has animated features as well, and they are smooth enough to make that crisp look. Below the slider is your usual website content. These are displayed as photos in a grid with no borders and spaces. Once you hover your mouse on it, you will see more information about the photo such as the title of the content and the category it belongs to. Some of the portions of Malmö also have other animations, which are not overbearing. They are visually stunning, as it surely fits the theme. 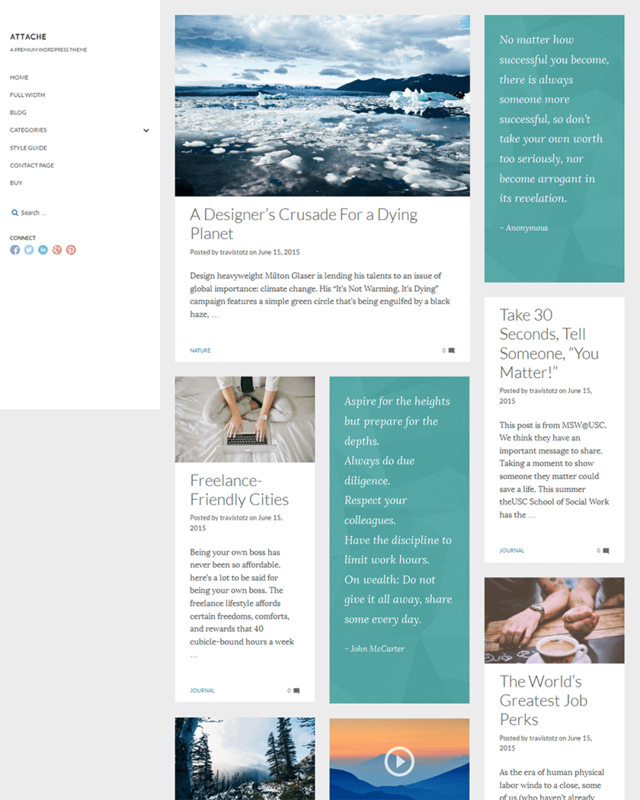 Brando is another one of those modern, blocky looking WordPress theme. It seems so straightforward and crisp. Some of its subtle features work as they enhance the whole web experience of the visitor. For instance, the default demo of Brando features a slider so simple and minimalist. It covers the entire page, and it only has an icon at the top left corner for the menu. What’s interesting about Brando is that some of its icons are clipped on the right corner, following the user wherever the user goes, whether he or she scrolls down or stays in one area. Scrolling down, the screen is split into two, a photo on the left or right, and a text on the other. It works as long as the photos you use are high resolution and artistic. Another cool element in Brando that each of these blocks seems like a mini page in itself. They can contain their own links, and you don’t have to go to a load a different page to see the content. Brando is definitely powerful, functional, and beautiful. Dylan seems like your usual WordPress theme that is more modern and sleek. It has the usual layout, and it doesn’t really look so different compared to other creative themes. This theme looks really clean without any frills. The colors are very basic, but it seems to be highly customizable, just like all the other themes. There’s really not much to look forward to with Dylan as the layouts are very similar to the other themes out there. However, Dylan makes up for its simplicity by putting a lot of animations in the website. There are various animations in the entire website. Some are as simple as animations that you see when you hover your cursor on certain icons. These are also different from one another. Although standard, Dylan ensures that its redeeming factor, its animations, are worth having and viewing. In addition, it is also very flexible and can be used for different purposes. 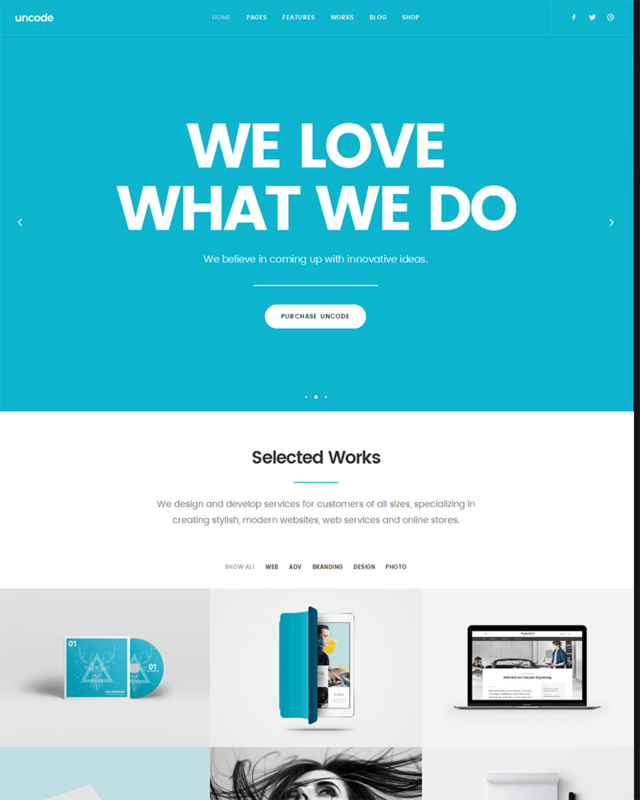 Just like Dylan, Dani is also a flexible, multipurpose WordPress theme that is actually simple yet has good animations that make it look visually appealing. Although not over the top, Dani’s animations look very nice as it follows the eyes of the website visitor. For instance, after seeing and playing with the slider, visitors will naturally scroll down for more website content. When visitors do this, website content quickly appear in smooth animations. Appearing is not the only animation seen in Dani. Hovering animations are also visible. 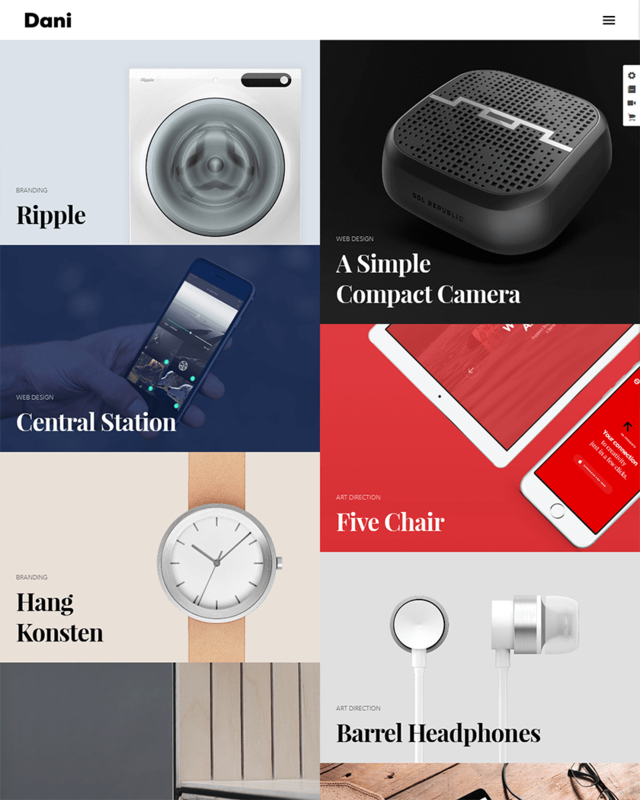 This time, they are subtle animations that seem to only give visitors something to look at when they explore the entire page. Dani also has good icons that creatives use. This can be of use for them when they need to add certain elements to their site, but not bombard the website with too many words. Overall, Dani is visually clean and enjoyable as its animations definitely works for the enjoyment of its visitors without being overwhelming. 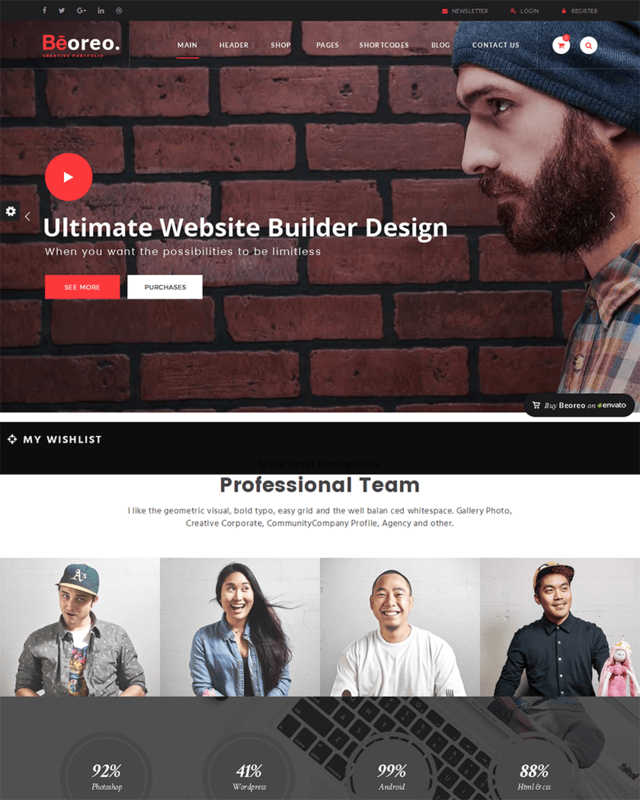 Mauna is a professional and creative WordPress theme for many uses. It generally has a standard template, but of course, it has unique attributes that make it stand out from the rest of the creative WordPress themes out there. Viewing one demo that the developers have prepared for potential users, you can see that the page ends with its full width background image. It has simple transition animations, so you don’t have to manually change the photos through a slider. On the background image, you can already see the website title and navigational links. What’s fascinating about Mauna is that it only limits the views of the visitors to those things that matter, like your photographs or artworks in the full width background image or slideshow. It is also a whole lot easier for visitors to focus on a certain type of information and not be cluttered by unnecessary stuff. Kudos is your average modern WordPress theme that has good standard features and a neatly designed layout. Although fit for creatives, Kudos really doesn’t have anything different. Kudos is highly customizable, which is great because the theme really looks very average although pretty. It also has other features that not a lot of themes have, and these features give more room for creative freedom for creatives. For instance, Kudos has different sliders for its landing page. 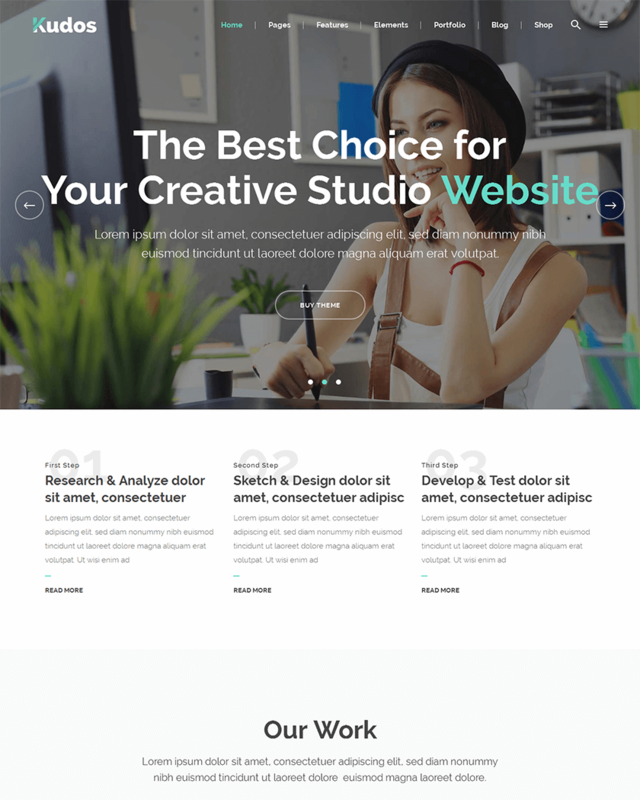 You can choose from seven options, namely a full screen slider, vertical slider, full width slider, split slider, blog slider, animated slider, or boxed slider. It also has other special features that are good to have. It has an app showcase feature, scrolling background text feature, floating element items, device slider, mobile showcase, and interactive banner. Overall, Kudos has all the necessary features, and bonus features, that are good to have for a theme. To make your website unique, though, you have to channel your creativity and customize Kudos fully. Woodie definitely has its own vibe. It is far from all the modern and sleek-looking WordPress themes out there. As the name suggests, the background of Woodie looks like wood, and to be fair, it still looks clean. Woodie has a foreground where the navigational links, the slider, and the website content are found. Scrolling down, but also in the foreground, you can find the footer with widgets. These are all compact inside the area of the foreground. 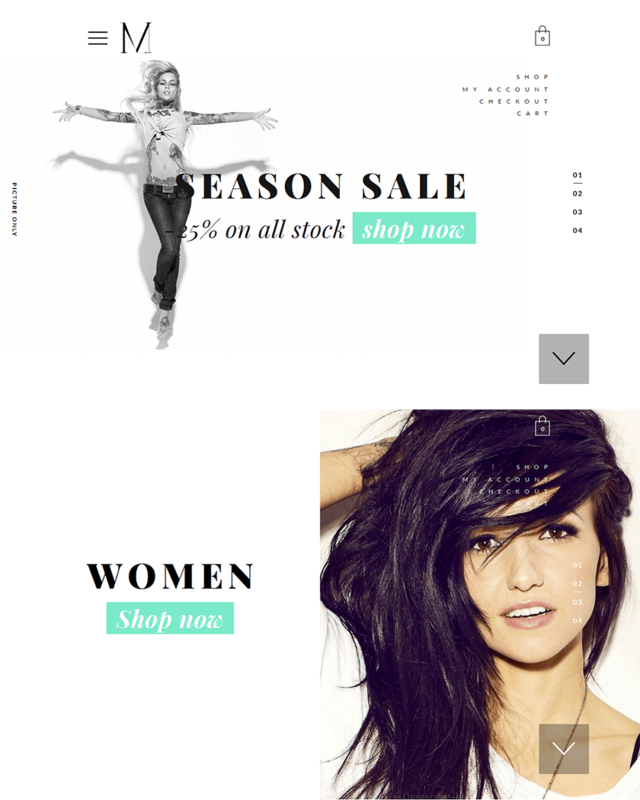 Website content below the slider are displayed as photos with short teasers in a grid. This extends from right below the slider until the start of the footer. Overall, the wood background could work if you are good at customizing the site, but the interface of Woodie is not exactly as visually appealing as the other websites. But if it works for you and you like how it looks, it could be worth a try. Attache follows a very clean design that tries to have everything accessible for the visitors. Instead of a header, Attache uses a vertical sidebar from top to bottom which is about a few inches thick. It has the website title, navigational links, a search bar, and social media icons. Each navigational link is a drop-down menu, if necessary. On the left is your website content, which has a quirky layout. You will see photos and texts combined. It seems that this side of the page can be scrolled without limits, and even if you scroll this part, the vertical sidebar with navigational links is fixed to where it is. Overall, Attache has a simple “what you see is what you get” design. It doesn’t have over-the-top features, but it definitely has features that you might want for your website. It is ideal for blogs, personal and creative writing, and perhaps even photo essay writing. Adios is a very beautifully-crafted WordPress theme that seems to fit fashionistas, although of course, it, like the majority of the themes, is customizable to fit whatever need. What’s nice about Adios is that it is very clean without looking too plain or average. The default demo opens with the standard feature of the majority of the themes out there -- a full width background image. Although Adios has a header, the contents are limited to just the website name or logo and the menu icon. Once you click on the menu icon, you’ll notice that the entire screen changes into the menu, and all of the categories are in huge letters. Although beautifully-designed, Adios can be disorienting for the untrained eye. Below the slider is the website content, and it is divided by just a small line at the left side of the screen. Scrolling down, animations can be seen, too. At the very bottom of the website, you will find a footer where you can put widgets. In the demo, however, the footer is limited to just the social media links right smack in the middle, making it look very clean and crisp. 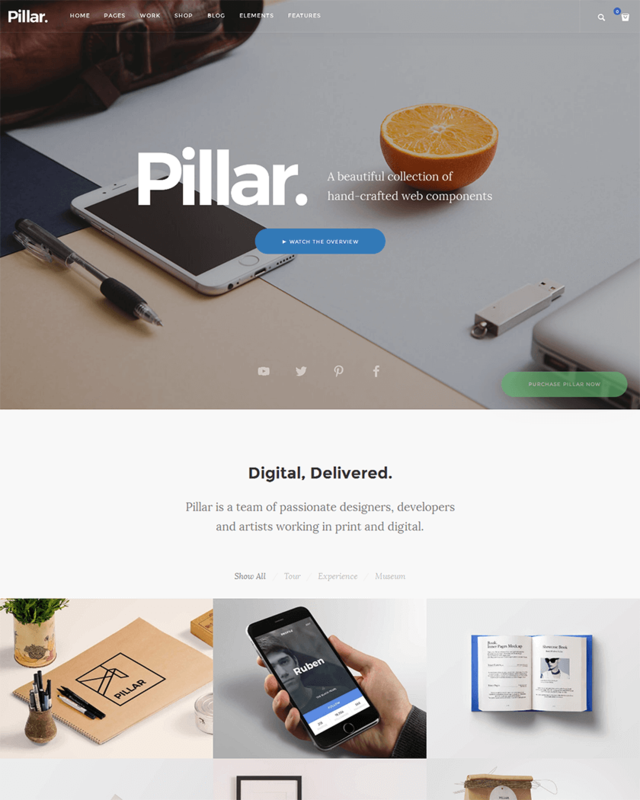 Many modern themes right now have the same look, as mentioned earlier, and it seems that Pillar has followed suit with its full width image that welcomes visitors when the site loads. It doesn’t really look different compared to other sites. To look unique, the website owner has to exercise his or her creative freedom so their website will stand out from the rest. As it stands, Pillar’s default demo will not make your website look any different. Although of course, Pillar has its strengths. It has a clean design. It also uses the parallax scrolling that subtly makes your website come alive. But again, Pillar is just your average design. It doesn’t seem like Pillar wants to stand out, though. 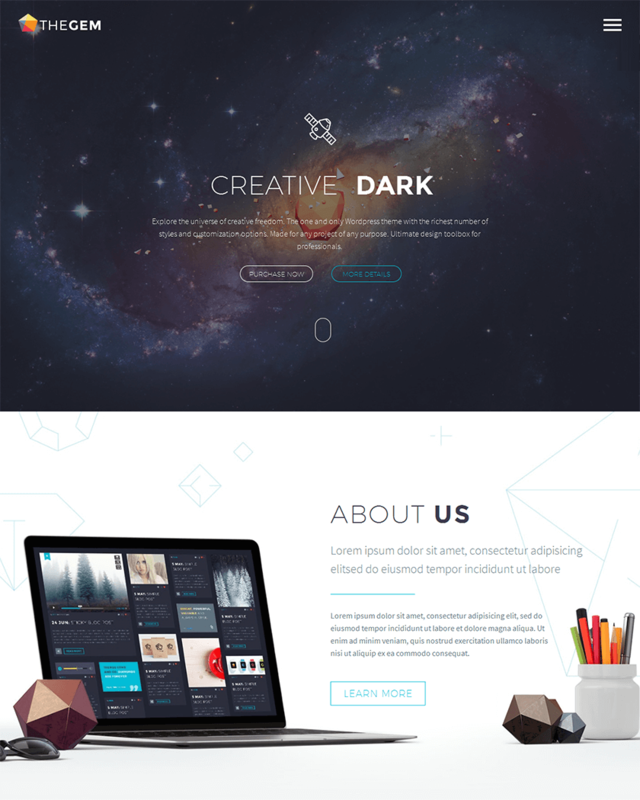 As a theme, it seems that it strives to be more functional, clean, and professional-looking for creatives to use. If that is that goal of Pillar, then it definitely achieved that. Just like Pillar, Assemble doesn’t seem so different either. But it has a minimalist vibe that Pillar didn’t want or didn’t think of having, seeing from its default demo. Assemble is the same as others in the sense that it has a full width background image, however, its background image is slightly smaller than the others. Upon opening the site, you can already see where the background image stops. But Assemble is more than just your average theme, actually. It has 18 homepages to choose from, and not all of these homepages feature a full width background image that is similar to other sites. In addition, the soft tones of Assemble make it seem very elegant, perfect for those who have that sense of style or for fashionistas who need to make their website. The header of Assemble is also different compared to the headers of other themes since it is in a frozen state. Even if you scroll down, you will still see the header, which makes for easy navigation for visitors. TheGem is definitely a multipurpose theme not just for creatives, but also for companies out there who want to make their company website appealing for the modern visitor. TheGem has only has two options for layouts: wide and boxed, but it has several menu layouts to choose from: classic, 100% width, hamburger, vertical, splitted, centered, and overlay. This theme also allows you to change the styles of your menu into light and dark, light and light, dark and dark, and your very own customization. TheGem proves how flexible it is by listing down the uses of the theme itself. 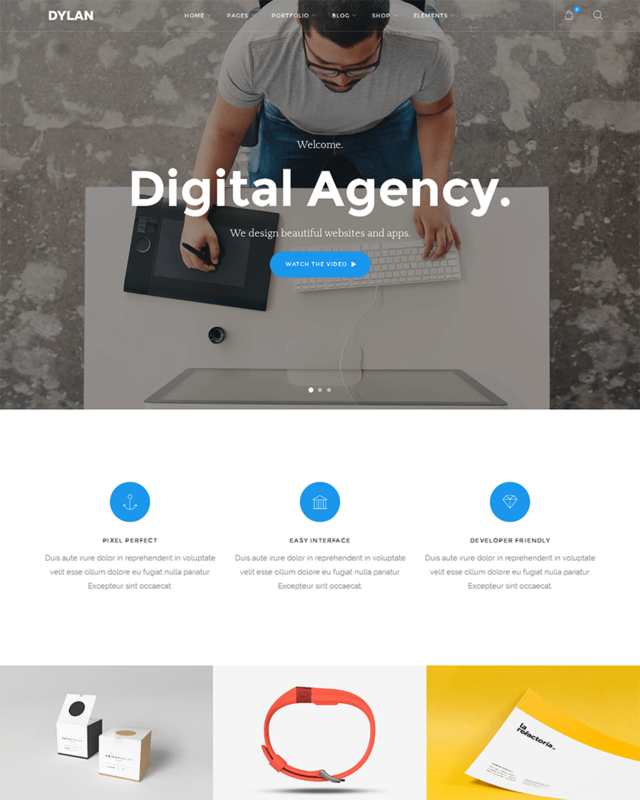 This theme can be used for agency websites, business websites, creatives websites, e-commerce store, app website, a landing page, photography website, portfolio, a one-pager site, and many others. Overall, TheGem is pretty simple, but what makes it unique is how you customize it. It really gives potential customers the freedom to recreate their own website for a unique twist to it. Fevr’s appeal is definitely for artists who are young and into the modern look. It looks very straightforward and clean, like how most designs are preferred now. 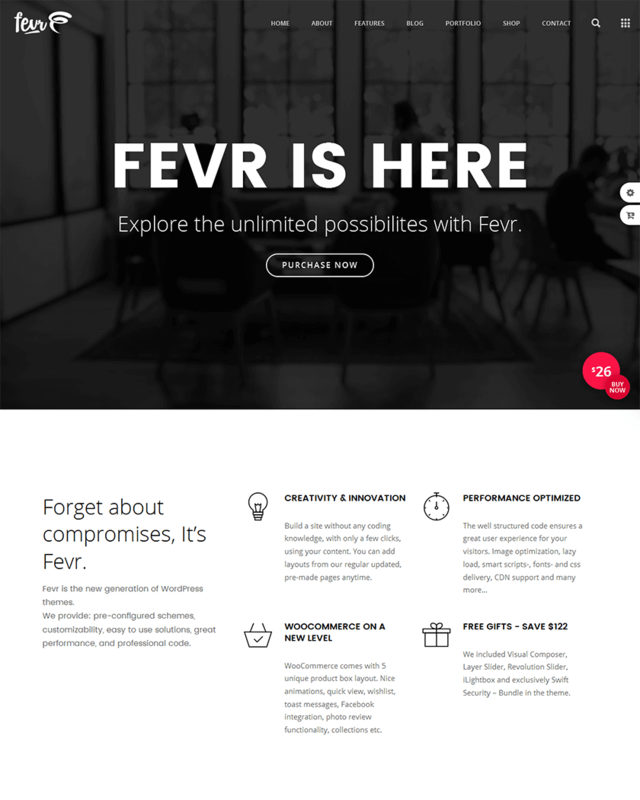 Fevr boasts having 20 demo concepts to show its flexibility and uses as a WordPress theme for creatives or for those who want to have a creative and modern WordPress theme. This theme also has over 50 unique page templates so you are not limited to the same look when navigating around the website. It also has premium plugins that will usually cost you a lot when you buy separately. Fevr is also multipurpose in its flexibility. It can be used by marketing agencies, digital agencies, design agencies, business and corporate companies, or even e-commerce stores. It can also be used by freelancers who do photography and other creative work. Overall, Fevr is a good bet if you are opting for a more modern look that appeals to the young audiences, especially if they are your target market. 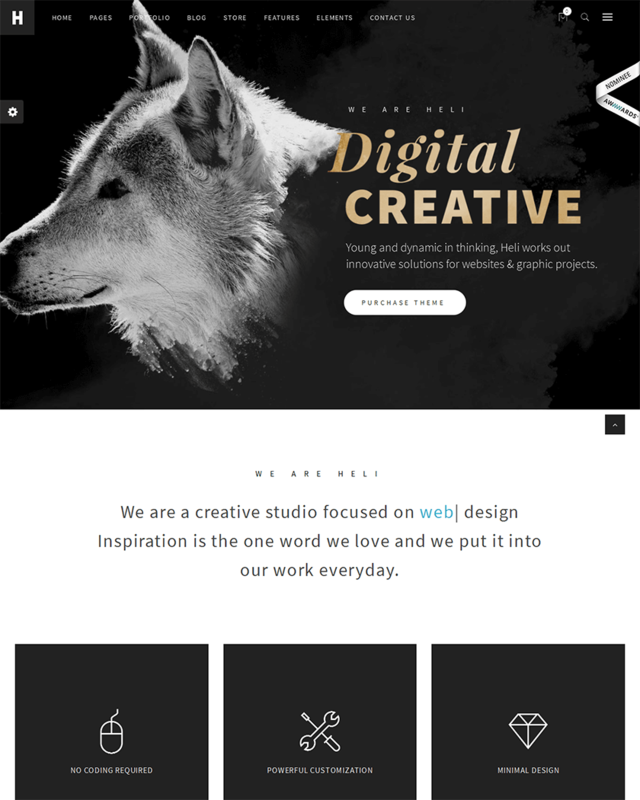 Bateaux is another flexible and creative WordPress theme that’s actually worth a shot. It has a lot of uses, proving its flexibility. However, as of now, its niche demos are limited to photographers and architects. 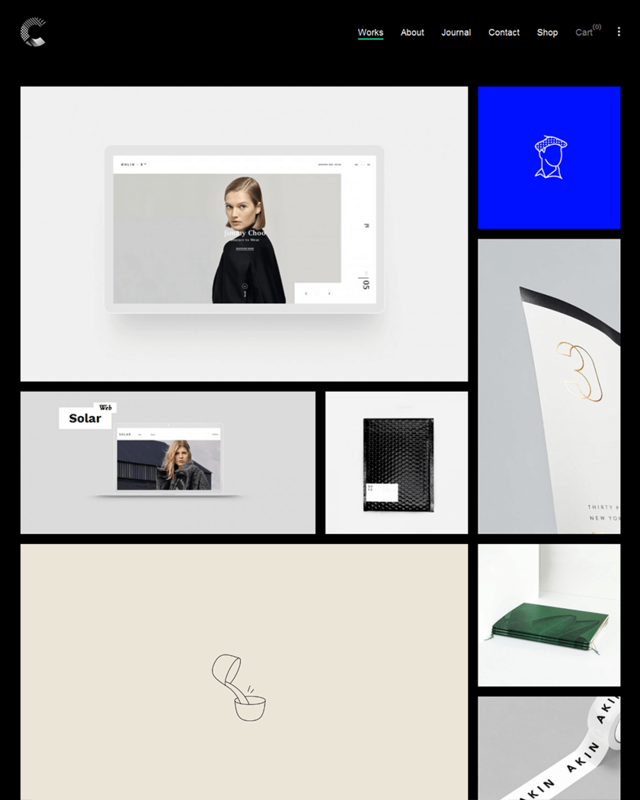 Bateaux prides itself for having 24 homepage concepts which actually vary. Although majority uses your standard full width background image, some are actually very different. This is good since you do not have to keep changing your theme when you want to rebrand this sooner or later. You use one theme yet your website changes. 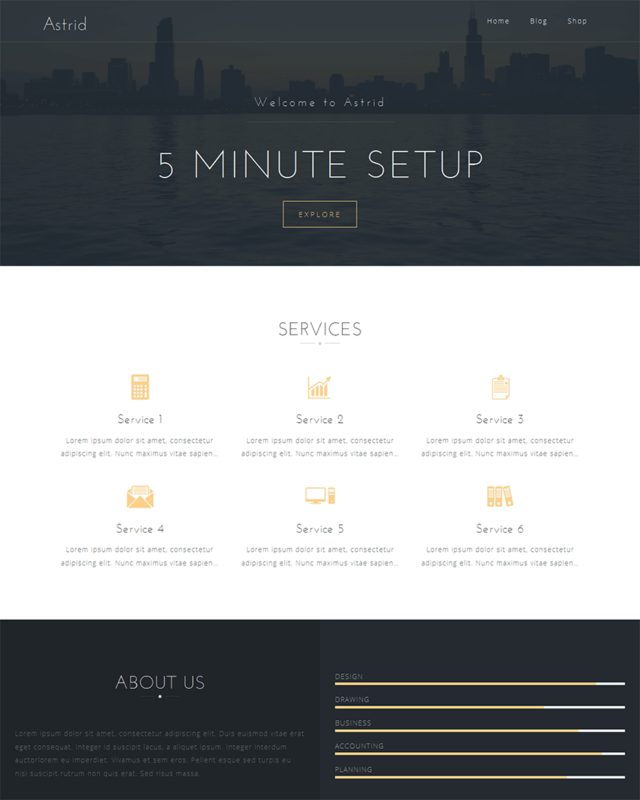 Overall, however, Bateaux still has standard features of your average WordPress theme. It really just allows you to customize the site freely, which is what is usually offered by most paid WordPress themes. What’s good about Bateaux is that you are ensured that whatever layout you choose, your website will look clean and modern. If you want to have that guarantee, then Bateaux is a good option. 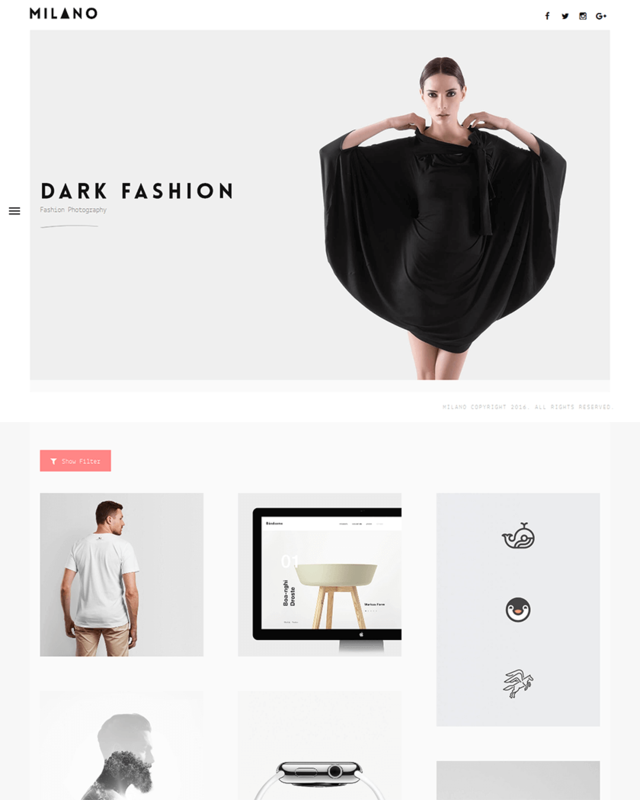 QOON is a well-thought of modern creative WordPress theme that really aims to leave a good impression on its viewers. It’s a conceptual view says it all, and it’s good to have a theme as funky as QOON. Its conceptual demo has a familiar layout. It has a standard frozen sidebar at the left that’s a few inches thick. It has your website title or logo, your navigational links, and your social media links. What’s different about the frozen sidebar is that you can have a background image to it. In addition, your navigational links can be highlighted, compared to those which are underlined when hovered by the cursor. You will notice that the frozen sidebar has a small arrow pointing to the left. When visitors click that, your sidebar expands to cover the entire page, featuring the entire background image of your sidebar. On your right is the website content itself, which is a slider. It can start with your company logo, and you can scroll down to show a description and some facts about your or your company. The good news is, this is not the only thing you can do with QOON. Go play with it. Heli has one goal in mind: to create a wow factor that’s long-lasting enough for your visitors to keep coming back or stay on your website. If that doesn’t happen, Heli hopes your visitors perceive you as how you want to be perceived -- experts in creativity and professionalism. This theme is no doubt multipurpose. Developers have created 40 pixel-perfect homepages for any kind of purpose, proving how flexible the theme is regardless how you want to use it. Heli also has a Thememove Core plugin, making the theme, and ultimately your website, faster and easier to customize. On top of that, you can just import the demo data with just one click. What’s good about Heli is that it loads fast, even though it seems to have a lot of features in the website. Its design is also very modern, so you are sure that this is visually appealing for artists and those who appreciate creativity. Although developed for movie production houses, director, and filmmakers, as the name suggests, FilmMaker can also be extended to creative agencies and even freelance artists. 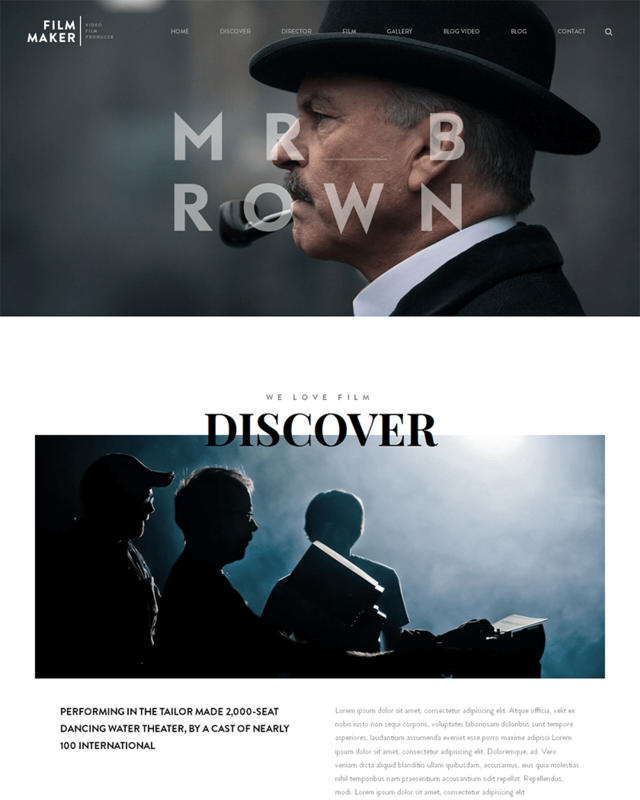 FilmMaker, however, follows the typical layout of most WordPress themes nowadays. It’s a scroll-down type of experience for visitors, which means that all the information that the visitors need to see can be viewed if they just continue scrolling down. Of course, you can still navigate around the site with links seen on the header. There is also a footer with social media links in it. What makes this good for filmmakers and movie production houses is that has a layout that lists all the movies into full width images and short descriptions about them. This looks really good, actually, for visitors, and movie production houses can maximize this by making sure their photos are high resolution and of good quality. Overall, however FilmMaker is not exactly a unique design. Nonetheless, it is beautifully made. The multipurpose Talon theme utilizes modern techniques to offer a high level of customization. You can make your home page standout out by opting for a full-width slider or static image header. In addition, you can customize your site colors, utilize Google Fonts, and add icons with the bundled SiteOrigin Page Builder plugin. You also have three footer widget areas to populate and two blog layouts to choose from. 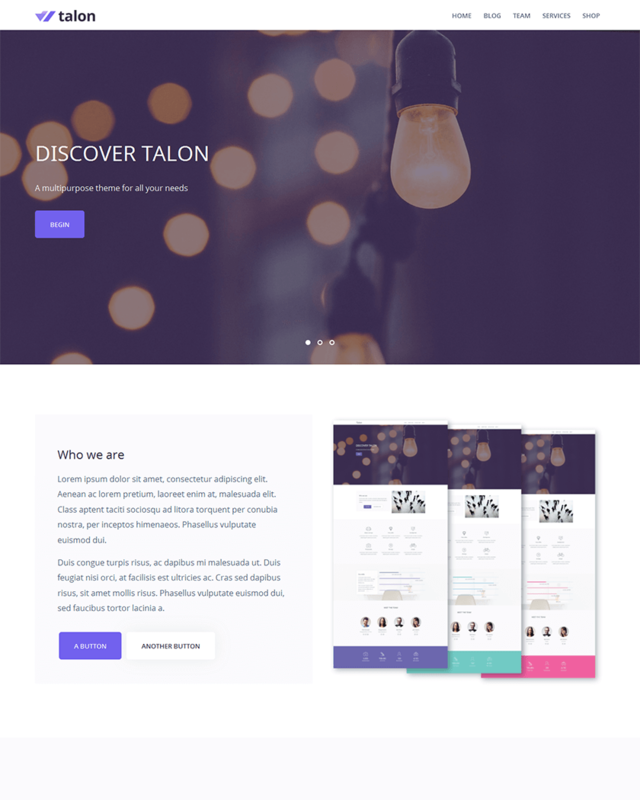 Talon is suitable for any type of portfolio site, but is particularly apt for the business portfolios of creative agencies. Furthermore, you can easily add sections for customer testimonials, staff bios, and clients case studies, all in one powerful package. 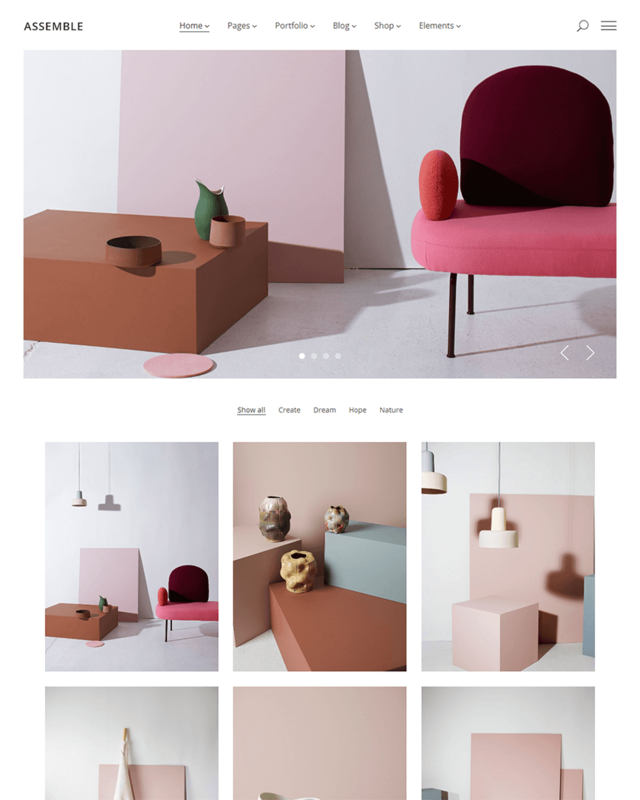 Astrid is a beautifully clean and modern theme that enables you to showcase striking imagery, within an easy to navigate site. You can ‘wow’ your visitors with a full screen header, which can optionally include a call to action. Built-in widgets and templates can also enable you to quickly and easily add other elements to your portfolio, such as services and employees. In addition, with the project portfolio feature you can easily and beautifully showcase your best work right on your site’s home page. 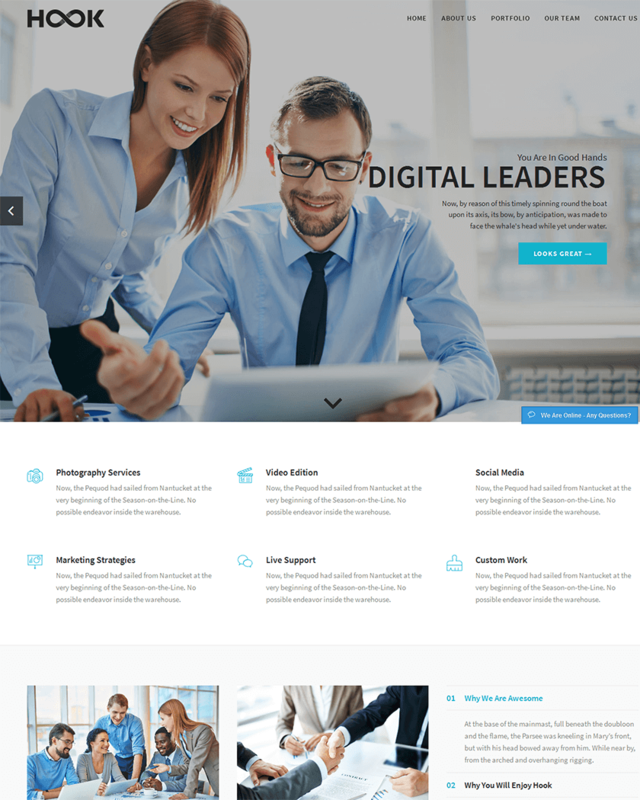 This theme is an excellent choice for a broad range of businesses, from tech teams to creative agencies. The impressive full screen header option is something you don’t often find with a free theme. This, along with plenty of customization options, will enable you to create a stunning website that showcases your work beautifully.